Does your toddler need a unique way to show their love for Purdue? With our Purdue Pete Toddler Rocker, your little Boilermaker can rock and roll all day long. 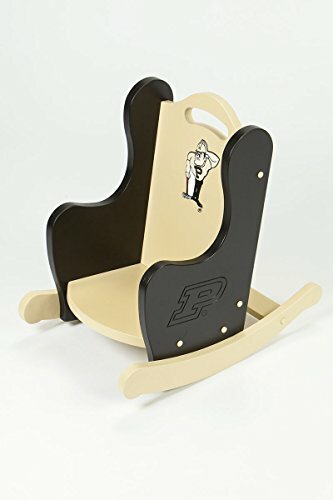 Our Purdue Pete rocker, handcrafted from durable Baltic birch veneer and hand finished with fully tested, water-based, child-safe finishes, and made with only the highest quality will stand the test of time for generations of lil' Boilermakers. Help your little fan be a Purdue fan for life and introduce them to Purdue Pete! When your little one outgrows it, save it for the next one or the next generation. We make this to last! We use only water based, kid safe finishes. The rocking chair is fully tested by a division of Underwriters Labs to ensure it's child safe. The Purdue Pete Rocking Chair ships fully assembled and is made with Hoosier Pride in South Bend, Indiana USA. The name, logo or indicia featured in this product are protected trademarks of the Purdue University.